The Radiance mirror redefines opulence with its classic white colour and outstanding handcrafted mirror frame. Give your living space a new life with this outward radiating herringbone patterned mirror. The frame is inlaid with a carefully handcrafted wooden frame panelled by camel bone chips. It has a beautiful circular shape that is highlighted by its wide outer frame, making it a perfect hall wall mirror. This excellently produced piece is available in antique mirror choices and is customisable to any size. Farrago design prides itself in creating a fusion of east and west through a flawless blend of material, fabric and light producing impeccable furnishings using traditional hand finish techniques. 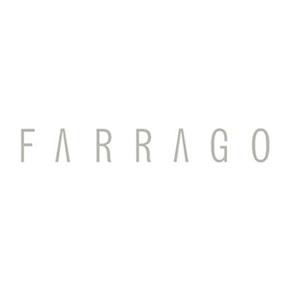 Farrago brings history into the now by making use of material like camel bone and cattle horn. With an eye for details, the brand employs craftsmen trained in traditional inlay techniques and cutting edge technology to create one of a kind artifacts that reflect elegance and uniqueness. The founder, Reeta Gyamlani, originally from India, founded the brand in New York to bring integral Indian craftsmanship infused with her passion for luxury designer to the world of interiors.